Date: Wednesday 1st August 2018. Venue: Oxford City & County Bowls Club. Attendees: Colin Barson (CB), Matt Cavill (MC), Maurice Earp (ME), Simon Hathaway (SH), Jemma Hayward (JH), Trevor Lambert (TL), Michael North (MN), Paul Peros (PP), Dave Thornton (DT), Ali Wolfe (AW). 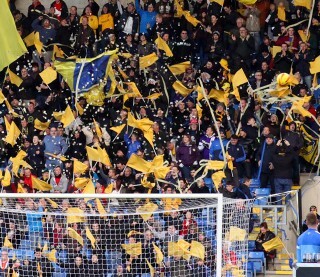 TL reported that the City Council had confirmed that the Community Right to Bid renewal application for the Kassam Stadium had been approved and the Stadium was now listed as an Asset of Community Value for a further five years. Members had been informed. CB and PP had met Niall McWilliams (NMcW, OUFC MD) on 19 June; CB had met OUFC Owner Sumrith Thanakarnjanasuth (Tiger) in Ireland on 10 July; and CB had met NMcW again on 24 July, and CB fed back the details of these meetings to the committee. CB’s meeting with Tiger had been largely a ‘getting to know you’ meeting and the first opportunity to do so. It was a good open meeting and both agreed to meet again when possible. Tiger did, though, confirm that he had met with Firoz Kassam regarding our stadium situation, and positive talks are continuing. The meetings with NMcW had been more substantive. The main items discussed are highlighted below. Losses from the women’s team last season had been at a level which was unsustainable in the longer term and had necessitated changes, whilst retaining a women’s team as an important component of the club. The decision to downscale and play in a lower division was felt necessary to safeguard the continuance of the women’s team. Season ticket sales, in number, (discussed on 19 June) were at that time very similar to last season, and a little increased in revenue terms, due to the mix of tickets sold to date. The ENSCO rental agreement at Court Place Farm had a year to run, but we were informed that it is generally at below market rates, so does not particularly disadvantage the club. NMcW expected the arbitration dispute to be resolved shortly, and although this had not happened at the time of writing these notes, it was long overdue and necessary in order that the club and stadium company move forward in their working relationship. A shirt sponsor was needed for the under 18 team and OxVox would discuss costs with the club with a view to considering taking it on. OxRails: The necessary certificates have been awarded and the initial trial rail at the back of the East Stand has been fully installed and appropriately stress tested. It will remain in place and will see its first use in the home match against Fleetwood. Subsequently the plan is to install a further 10 rails in the top rows of the East Stand, and to repeat this in the top rows of the away section of the North Stand. Defibrillators: OxVox has received confirmation that defibrillators are normally present at the conference centre reception, in the home dugout, and with St Johns Ambulance at the corner of the East Stand and South Stand lower. This is reassuring, but we will seek further clarification from the club about the protocols for a swift response to cardiac events on a match day. Seat Cleaning: Some seats were soiled by bird mess at the pre-season friendlies. The stadium company was responsible for arranging cleaning, for which the club pays. We were assured, by the stadium company, that dirty seats will be cleaned by August 11th for the Fleetwood game, and that a company has been hired to maintain the seat cleanliness on a weekly basis. Furthermore, it was confirmed to us that the seats had in fact been cleaned twice already since the end of last season, but the number of pigeons was far in excess of previous years. The stadium company had also used a falcon to chase the pigeons away. Toilet Cleaning: OxVox also discussed the cleanliness of the stadium toilets, having received numerous complaints from supporters about them. We were assured by the stadium company that they are cleaned regularly, and before every game, and inspected before every game. The stadium company’s view is that they appear much worse due to the fact they are 18 years old and aesthetically look very tired and worn. Floodlights: We noted that 20 of 54 North Stand floodlights were out of action at the Leeds United friendly. The club’s view is that the current light level is above the legal minimum, and no referee has complained. However, this is a matter which is unlikely to be resolved until the outstanding arbitration issue reaches a conclusion. Sensory room: Progress is ongoing. All supplies are now sourced, reported AW and DT. The community trust have a room which they can use for this purpose on match days, and now require a place to store the equipment on non-match days, which is under discussion. East stand mural: Finalising of images for the mural is in hand, reported SH, and it is hoped that the mural will be in place in October. 125th anniversary: DT has been reviving the issue of a Blue Plaque for the Britannia Arms to mark the place of formation of the club in 1893. This has been a long running saga going back nearly four years. It was hoped that this could be in place around the time of the 125th anniversary in October. SH is involved in organising a walk from the Britannia to the Kassam Stadium, about which details will be available nearer the time. MN and MC have designed a series of commemorative badges. Edit: Since the meeting it has been confirmed that the plaque is approved by the Blue Plaque Society pending listed building consent and also by Ember Inns (owners of the Britannia), pending final head office approval but that it is impossible to have it in place in time for the 125th We are exploring the possibility of some sort of alternative for October, as an interim measure. The Priory: CB, PP, WH and AW inspected the Priory, at the invitation of the stadium company, alongside Jeremy Faulkner of the Oxford United Community Trust, to ascertain the condition of it and whether it was at all viable for OxVox to get involved in refurbishing it in order that it could re-open as a match day bar. PP is a property developer and WH a retired property lawyer, so have considerable experience in this field. It was their view, shared by all, that it would cost several hundred thousand pounds just to get the building up to a basic standard, before any fitting out etc could be considered. It is the view of OxVox that, in its current condition, it would not be a viable project for us to get involved in. TL reported that arrangements were in hand to amend bank signatories and to send updated reports and accounts for the last two years to the Financial Conduct Authority. Payments of £137.20 to DT for sensory room equipment and £50 to TL for room hire were due. The membership total was now 1,010, reported ME and TL. September membership renewals would be notified individually in the next few weeks. A match day OxVox stall would be set up to run on 4 or 5 occasions in the season pre-match, subject to club permission. SH showed designs for display banners to draw attention to the stall. TL had completed and sent the trust’s registration form to Supporters Direct, to maintain our registration. A number of questions received from members in advance of the meeting have been answered as relevant above. Before organising a members’ meeting CB will ask the club about its plans for a fans’ forum, to avoid any clashes of dates. The meeting ended at 10.15pm. All present thanked the Bowls Club for their hospitality.